Reduce your energy consumption and improve your overall comfort level with help from H & I Home Services, LLC. Based in Phoenix, Arizona, I offer FREE Insulation Evaluations & Quotes. Make your home a more Energy Efficient and Comfortable place to live through my Insulation Solutions. I offer packages ranging from an R-11 to R-49 . 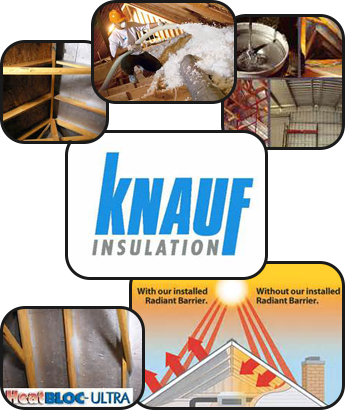 These include Knauf™ Insulation Products that are blown in from a hose of a truck. This process helps for better coverage over the majority of your living space. Remember one thing about Insulation, "If it doesn't touch, it doesn't insulate". The average attic temperature on a typical Summer day in Phoenix is 150*, or even more on some homes. To help lower the temperature of your attic, I can spray on a Radiant Barrier Product underneath your roof deck. I use the brand HeatBloc™. It is an aluminum-colored, water-based, and low-emissivity (low-E) coating. Applied to the underside of a roof deck material in your attic, HeatBloc lowers your roof's surface emissivity. As a result, it blocks more than 75% of the Radiant Heat trying to enter your homes attic. Basically turning your roof into a low-E roof. By lowering the Summer temperature in your attic, this helps improve the overall R-Value of your current insulation. This product also works in reverse during the Winter months, as your indoor heating is now trying to escape up into the Attic. HeatBloc Radiant Barrier helps your home become more Energy Efficent & Comfortable all year long.